Summerlin, Nev. — The Sacramento River Cats (4-4) fell victim to their first sweep of the season as the Las Vegas Aviators (7-1) took three out of three to kick off their inaugural season at the brand new Las Vegas Ballpark. Right-hander Shaun Anderson lasted just three innings for the River Cats as the Aviators nearly tied a Pacific Coast League record with four triples in one inning. Las Vegas put up three runs in the third as Anderson was chased in his shortest start since August 23, 2017 with the San Jose Giants. The Garcias, designated hitter Anthony and catcher Aramis, provided half of the club’s hits during Thursday night’s series finale while third baseman Zach Green raked his third home run of the year. The River Cats will catch a flight to Salt Lake City to begin a four-game series with the Salt Lake Bees. Lefty Ty Blach (0-0, 6.75) will be on the mound for the River Cats facing right-hander Forrest Snow (0-1, 5.40) for the Bees. First pitch is set for 5:35 p.m. (PT). Catch all of the action live online at rivercats.com, on the MiLB First Pitch app, and on the air on Money 105.5 FM beginning at 7:00 p.m. (PT). West Sacramento, Calif. — Number four Giants prospect Shaun Anderson delivered five strong innings on Saturday evening, his first start of the season for the Sacramento River Cats (2-1). A pair of home runs and two big innings paced the offense to an 11-5 victory over the Rainiers (1-2). Anderson, a highly-touted Giants farmhand, looks to improve on a solid 2018 season where he made eight starts for the River Cats going 2-2 with a 4.18 ERA. Tonight Anderson was given a huge boost by his offense, which exploded for eleven runs on eleven hits through four innings. The offense came from up and down the Sacramento lineup, with each starter reaching base and scoring at least one run. Catcher Aramis Garcia and third baseman Breyvic Valera each launched their first home runs of the season. It was the second night in a row that Sacramento jumped out to a sizeable early lead, but this time the River Cats’ bullpen would close out the win behind solid efforts from righties Tyler Rogers and Ray Black. The River Cats will play host once again to the Rainiers for game four of the five-game series. LHP Ty Blach (0-0, No ERA) gets the nod for Sacramento while the Rainiers will counter with LHP Justus Sheffield (0-0, No ERA). First pitch is set for 1:05 p.m. (PT). Catch all of the action live online at rivercats.com, on the MiLB First Pitch app, on the air on Money 105.5 FM. WEST SACRAMENTO, Calif. – The Sacramento River Cats have announced their Opening Day roster in anticipation of the start of their 20th season in Sacramento. The roster features an exciting mix of returning fan-favorites like Austin Slater, Tyler Beede, Ty Blach and Stephen Vogt, prospects Shaun Anderson and Aramis Garcia, and thrilling newcomers Anthony Garcia, Zach Green, and Mike Gerber, among others. 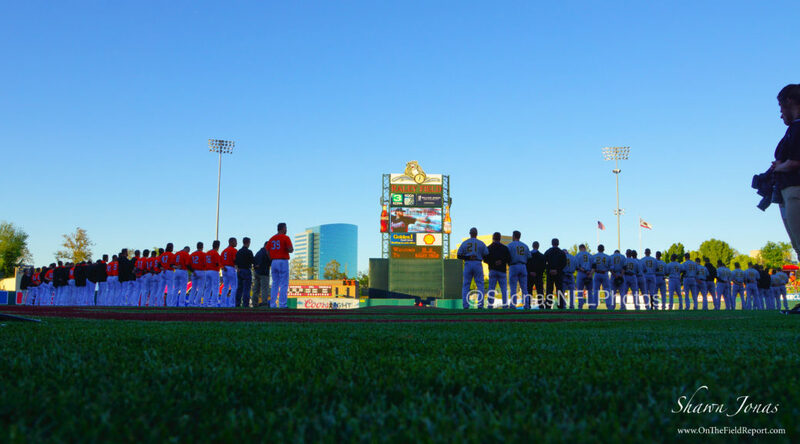 The River Cats open 2019 regular season play on Thursday, April 4 at 7:05 p.m. at Raley Field against the visiting Tacoma Rainiers (Seattle Mariners). The active roster will be reduced to 25 before the first regular season game. Fans can get their first look at the 2019 River Cats when they play a scrimmage against the Advanced Class-A San Jose Giants on April 1 at Raley Field. First pitch for the scrimmage is set for 6:05 p.m.
West Sacramento, Calif. – The Sacramento River Cats will host a prospect-packed scrimmage against the San Jose Giants – the Class A – Advanced affiliate of the San Francisco Giants – on Monday, April 1 at Raley Field. Tickets for the game start at just $5 and are available now at rivercats.com. This pre-season scrimmage is an extension of Spring Training and is likely to feature several of the San Francisco Giants top prospects. Catcher Joey Bart and outfielder Heliot Ramos – the system’s top two prospects according to mlb.com – are expected to take the field for the visiting Giants, while Sacramento fan-favorites Shaun Anderson (No. 4), Chris Shaw (No. 11), Aramis Garcia (No. 22), and Tyler Beede (No. 24) will likely suit up for the River Cats squad. First pitch on Monday, April 1 at Raley Field is set for 6:05 p.m. Gates for the game will open at 5:00 p.m. for all fans, with parking lots opening at 4:30 p.m.
General admission tickets to this special scrimmage start at just $5. There will also be a $10 ticket option, which includes $10 in food and beverage value for use at any Raley Field store front or portable. Parking will be $5 for the event. Tickets are available now at rivercats.com. Membership plans and special ticket packages are available by calling the River Cats ticket hotline at (916) 371-HITS (4487) or emailing tickets@rivercats.com. A full promotions and giveaways schedule for the 2019 season is now available at rivercats.com.